Clean WateR3 is a federally funded Specialty Crops Research Initiative grant focused on research and outreach to help growers Reduce, Remediate and Recycle irrigation water. The grant team is managed by Dr. Sarah White at Clemson University and includes many research collaborators. We also collaborate with a number of industry partners and sponsors. Clean WateR3 welcomes and encourages participation from other organizations and researchers. If you have general questions or comments about water quality, technologies, or monitoring, we would like to hear from you at watereducation@ifas.ufl.edu. We also welcome you to subscribe to our newsletter. Growers recognize the need to conserve water and reduce runoff, but changes to water management can be risky. We aim to support nursery and greenhouse growers with research and information. Clean WateR3 strives to provide growers with the information they need to manage irrigation water effectively. We appreciate your input. If you have any resources you would like to see posted on our site, or if you have questions about water management or about our program, please contact us. Our collaborators include university and industry colleagues who are undertaking research on water treatment and management. Sarah, WateR3 project director, will evaluate remediation technologies targeting nutrient and pathogen contaminants. Paul leads outreach efforts for WateR3 and the Water Education Alliance for Horticulture, and undertaking research on filtration and chemical remediation. Darren will manage the collection of water samples in Southern California, and assist in developing and delivering workshops. 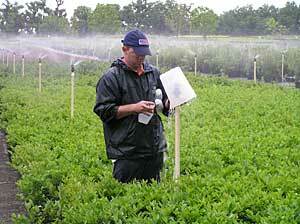 Lorence studies irrigation and runoff management in nurseries, and effect of water quality on plant growth. Rosa is interested in improving water management in the green industry, specially in closed irrigation systems. Alexa will be using social science research techniques to identify specific factors that influence growers' decision making, which will guide Extension materials development. Laura is part of the sociology team conducting grower perceptions research that will guide Extension materials development. Chris will evaluate the efficacy of using a treatment train bioreactor system to manipulate oxidation-reduction potentials to target removal of both nitrogen and phosphorus from production runoff. Phil provides expertise on the biology of pathogens found in greenhouse water, helping to author the Alliance's article on pathogen biology in GMPro. Maria will undertake research on filtration and chemical remediation, and aid with extension activities including this website. Dewayne specializes in water footprint and carbon footprint of water for the model production system components using life cycle assessment. John will focus on water and nutrient management to reduce contaminant loading into recycled water systems. Andrew research focus is water and nutrient management in production of container-grown ornamentals. Cassandra will focus on management of latent Phytophthora infections in nursery stock through microsensor-mediated irrigation. Rob is a Professor at the University of Massachusetts where he supervises the diagnostic laboratory. With a research focus on plant bacterial and fungal diseases, Rob provides expertise in understanding the biology of pathogens found in irrigation water. He has helped author Alliance articles in GMPro magazine. Rick is the Technical Support Manager at Griffin Greenhouse and Nursery Supplies. He has been very generous in providing his expertise on chlorine dioxide to the Alliance, helping us both in the planning of workshops and the preparation of articles for GMPro. Bridget will conduct consumer research to better understand how plant consumers will react to marketing and merchandising that includes information about a plant’s water use in production and in the landscape. Bert is investigating the effects of recycled and remediated water on plant growth, quality and physiology. Thomas will develop a model to manage nutrient and pathogen loads in irrigation runoff, and evaluate water treatment technologies. Bill is a Technical Manager at Blackmore with an interest in plant nutrition, media, and water. Bill helped author the Alliance's first article in GMPro magazine, and is helping to coordinate upcoming Alliance workshops in the northeast. 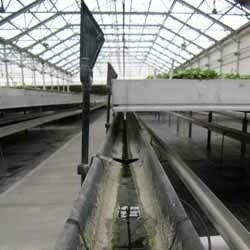 An Adjunct Professor at the University of Guelph (Canada), Youbin conducts research on many aspects of greenhouse production, including water disinfestation technologies. Youbin will be an author on several of the Alliance's articles in GMPro magazine. Jennifer conducts research on management of Phytophthora spp. in nurseries. Walter is the Technical Services Manager at Monrovia’s nursery in Dayton Oregon. In this role he oversees irrigation, fertility and pest management, as well as environmental issues. Dan leads the nursery operation modeling and water management system simulation team. Charlie will focus on the economic analysis of water management strategies and assess the economics of developed models. Laurie will assist with coordinating and overseeing the floating Treatment Wetland research in Virginia. Saurav will assist in development and deployment of the online decision support tool to aid growers of containerized crop production systems and also assist in implementing the data management plan for the project. Jim will evaluate treatment technologies for remediation of total suspended solids and mineral nutrients under controlled conditions and in commercial ornamental nurseries. David will assist in the development of a decision support tool to manage nutrient, carbon, water, and monetary flows in nurseries and conduct a research study on the effectiveness of floating wetlands for treatment of nursery runoff. Dr. Hong's research program focuses on biology and management of plant pathogens in irrigation water. He has lent his expertise to the Alliance's GMPro articles on chlorination, and his knowledge of Pythium and Phythopthora is an asset to the group. Our Advisory Board are industry leaders who will help our Team assess water treatment technologies and evaluate project progression. CleanWateR3 is supported by several grant-funded projects and contributions from our industry sponsors. If you are interested in contributing to this program, please contact Paul Fisher at pfisher@ufl.edu. If you have questions or comments about water quality, technologies, or monitoring, we would like to hear from you. We also encourage inquiries from other organizations and researchers interested in participating in the Alliance. Please send us a message at watereducation@ifas.ufl.edu.